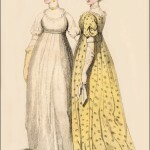 This print shows two examples of the same dress, with variations in fabrics, colors, and trimmings. 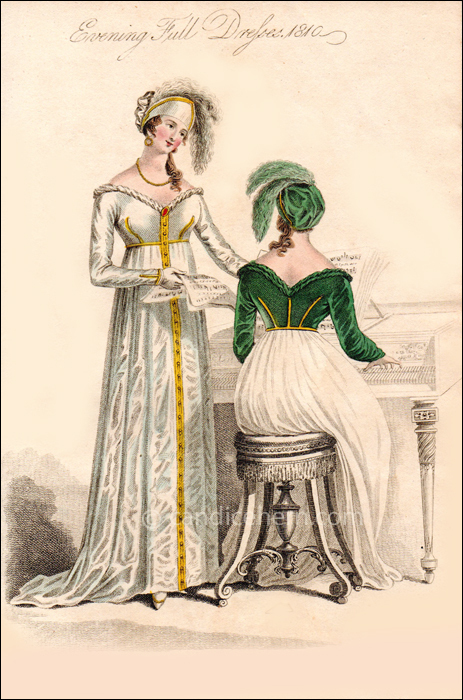 This would have been helpful for the professional or home dressmaker to see different ways in which the same pattern could be used, as well as seeing both the front and back of the dress. “No. 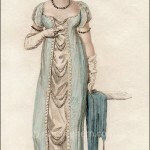 2–Evening Full Dress. A white satin round dress, with half yard train, laced up the back and seams with gold twist, ornamented round the neck with a full twill of frosted satin or white crape, and down the front and at the wrist with gold braiding, and small drop buttons. It is made to sit high on the neck; cut to a point in the centre of the bosom and the back; a gold band encircles the waist. A white satin Emsdorf helmet trimmed with gold, ornamented with two white craped ostrich feathers. White satin shows embroidered with gold; white kid gloves; gold necklace and ear-rings; cornelian brooch. The hair dressed in ringlets on each side of the face, with a long Theresa curl falling over the left shoulder.